On December 18, 1993, the United Nations General Assembly approved Arabic as an official UN language. We’ve been celebrating it every December 18 since 2010, when the United Nations Educational, Scientific and Cultural Organization (UNESCO) officially established Arabic Language Day! The day is dedicated to the long history of the Arabic language and the many works of literature and philosophy that are written in Arabic. Its purpose is to promote linguistic as well as cultural diversity in the world. On that day Arabic, one of the six official languages of the UN, is spoken in the UN. Originally, the word alcohol came from “al ghoul” in Arabic, but now the Arabic word “al kuhool” is derived from the English word alcohol. So you can be archaic or contemporary when next you ask for a drink. Less complicated in origins would be: zarafa (giraffe), quhwa (coffee), aljabr (algebra) and suffa (sofa). Say them three times and SHAZAAM! Now you speak Arabic. Each year UNESCO sponsors a symposium to celebrate Arabic Language Day. Last year’s events included a poetry reading and a musical recital. This year look for events in an urban area near you. Sometimes the only way to know a culture is to communicate with it. Meet and talk to your Arabic neighbors. Break bread together and learn not just your differences, but what you have in common. Alchemy, algebra, astrology, chemistry, and medicine all claim Arabic as their first language. During the period of the crusades, the most enlightened part of the world spoke Arabic. As the Moors conquered the Iberian Peninsula and returning crusaders brought Arabic influences back to a Europe still in the Dark Ages, they spread the beauty of the Arabic language and the sciences defined in it. The richness of the Arabic language, one of the oldest languages in the world, enthralled European scholars from the beginning. Christians in Spain from the tenth century, onward through the Moorish occupation, learned Arabic to read the literature and poetry. Writing was more complex and the images created by the words more fleshed out than the other, newer languages. Arabic is one of the oldest and largest languages in the world. 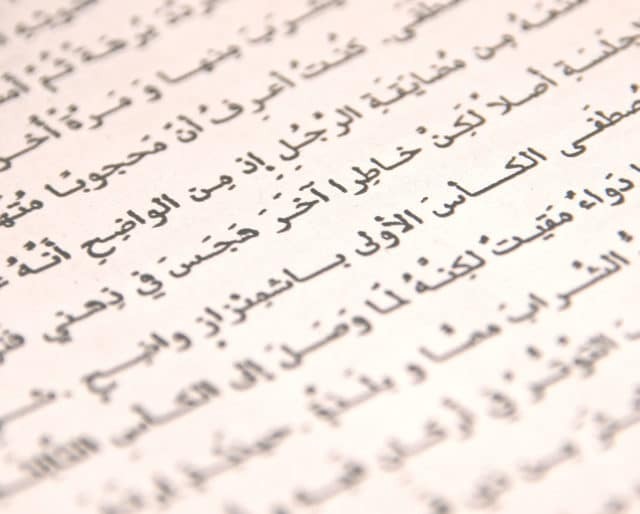 More than 7,000 words in the English language are either Arabic or derived from Arabic. While many may now be obscure, at least 500 are working words in our everyday conversations. Alcohol, cotton, alcove, baroque, monkey, soda, candy, saffron, sumac, monsoon, even tuna, to give you a brief example, are all “borrowed” directly and indirectly from the original Arabic.